eD@HoMe: New covers from Malaysia!! 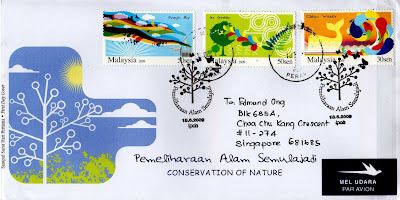 On 16th June 2009, Pos Malaysia issued a set of 3 lovely stamps on "Conservation of Nature" in conjunction with the World Environment Day on June 5. The stamps came in three designs featuring themes of “Clean Water”, “Go Green” and “Fresh Air”. Both the “Go Green” and “Fresh Air” stamps are available in 50 sen denominations while the “Clean Water” stamp is available in 30 sen denomination. These stamps can be seen in the following covers that I am sharing with you today. 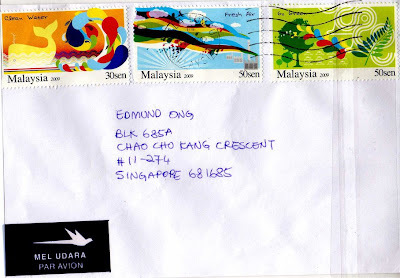 The first cover, a FDC was sent by my trading partner, Khor Kok Keong. Thank you so much! Coincidentally, Kang Wei Xie, a reader of my blog sent me the same set of stamps as well. Thank you too! It is always exciting to receive covers from abroad, especially from someone new. I welcome all! Pls enjoy these two lovely covers and have a superb weekend ahead! Bye! I'm quite new to stamp collecting thing and happy to find out your blog. Hope to surprise you with some nice cover from Latvia. I'm pretty sure that you don't have any from my country. Welcome to my blog and also to stamps collecting. Hope you'll enjoy this awesome hobby. You are correct that I do not have any Latvia cover and I am looking forward to receiving yours. I will do the same for you.